The torrent community lost another familiar name this week after Bitsnoop decided to shut down. The site's operator has declined to comment on this decision but says that the site's data was handed over to fellow torrent search engine Zooqle. Founded in 2008, torrent search engine Bitsnoop was one of the fastest growing torrent sites at the beginning of the decade. When the site first came online it indexed roughly a million torrents, and it continued to expand in the years that followed. 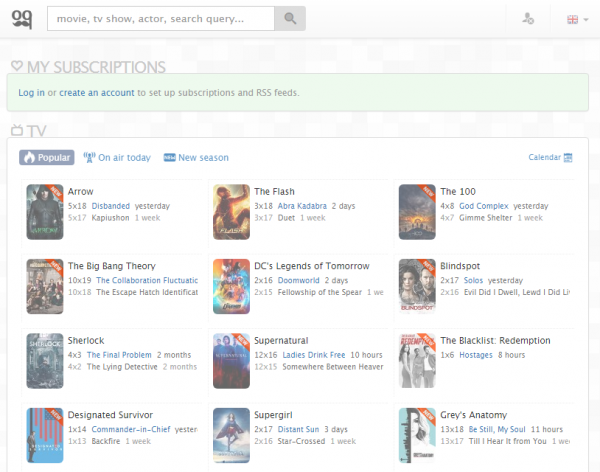 Earlier this week the site still served a healthy 23,862,834 torrents, but a few hours ago it stopped. 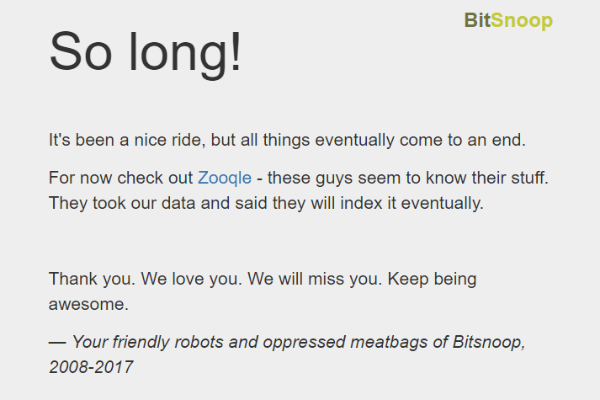 According to a message posted on the site’s homepage, Bitsnoop decided to shut down. “It’s been a nice ride, but all things eventually come to an end,” the message reads. TorrentFreak contacted the operator of the site to find out more, but he preferred not to comment. On the site we read, however, that not all of the site’s content has been lost for good. Bitsnoop has shared its data with their friends at fellow torrent search engine Zooqle, who may add it to their database later on. “For now check out Zooqle – these guys seem to know their stuff. They took our data and said they will index it eventually,” Bitsnoop’s operator writes. With Bitsnoop’s shutdown the torrent community loses another familiar name. Over the years the site has been featured in our top ten of most-visited torrent sites a few times, but in recent years traffic dropped. Like many other sites, BitSnoop is blocked by ISPs in several countries including the UK and Italy, and it was close to being blocked in Australia as well. As for Zooqle, this site is a relative newcomer. It first appeared online last year and had been steadily expanding since, thanks to traffic from other sites including meta-search engine Torrentz2. Note: The “farewell” message was first posted on March 31, which is close to April 1st, but we couldn’t see any hints suggesting that it’s a prank. New Spectacular Logo Coming For BitSnoop?